IP CCTV uses a wired or wireless IP network as the backbone for transporting digital video, audio and other data. An IP CCTV system allows video to be monitored and recorded from anywhere on the network, whether it is on site via the local area network (LAN) or remotely via Internet or a wide area network (WAN). Power over Ethernet (PoE) technology can easily be integrated to enable the network infrastructure to also carry power to network video products. If it’s possible to get a network connection between the camera and the server location, it is possible to reduce cabling costs by transmitting the data wirelessly. It is possible to record simultaneously to multiple NVRs or to the camera itself. This offers an additional safety net to recover footage in the event of damage/corruption to data on the main NVR. The dramatic improvements in hardware have been matched by powerful analytics software. Video Management Systems (VMS) can be combined with other software to allow for applications such as licence plate recognition, people counting, and motion detection. High-end NVRs (network video recorders) allow existing analogue CCTV cameras to be incorporated into the IP system. This can significantly reduce the initial costs, and allow a phased approach towards a complete IP Surveillance solution. You can login into a secure server remotely, using a web-based interface to view real-time footage on PCs or Macs, as well as on mobile devices such as the iPhone, iPad, and Android-based devices. Programs such as TeamViewer also allow for remote support and end-user training. Footage can be reviewed with multiple zoom on playback, even on fixed lens cameras, with no degradation of the image. This alleviates a common problem with analogue systems, where high levels of compression can often leave the image unreadable. A typical analog camera equates to about 0.4 MP (megapixels), whereas a standard IP camera offers 2 MP, which is more than five times the analog resolution. With some IP cameras ranging up to 10MP, it’s easy to see how the technology can cut down on the overall number of cameras required. A typical example would be replacing pan, tilt and zoom cameras (PTZs) on a garage forecourt with one IP/MP camera. IP cameras can be powered by a number of methods. If the IP camera is replacing an analogue camera, the existing power source can be reused or Ethernet cables which allow for Power over Ethernet (PoE) can be deployed. 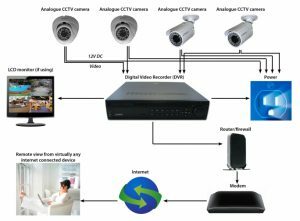 Existing network (Cat5e/6/Fibre) cabling and even existing coaxial cables that are used by the analog system can connect IP cameras to the network video recorder (NVR). It is possible to scale from a single camera up to thousands generally on a per camera license basis. Why not speak to our CCTV team about the IP CCTV solution. Prefer to talk to someone? Give our expert sales team a call and they will be happy to answer any and all of your IP CCTV related questions.